People are really working overtime to redirect the narrative pertaining to the Orlando Islamic Terrorist Attack the last few days. You have those on the left (media, government, other assorted morons) trying their best to call this anything but what it is. To them it was a "hate attack", which is apparently the opposite of a love attack, which I imagine is something like unicorns farting rainbows or something. Clearly, they say, this "troubled" or "mentally ill" or "homophobic" man was just a hater. And also his "AR-15" (actually a Sig Sauer MCX Carbine) made him do it. And then you have those on the stupid side, aka the "tin foil hat-wearing crowd", saying all over the internets that this was all some big false flag operation and either nobody was actually killed, or just a few were and all of Orlando are crises actors. Yes, the entire city of Orlando is actually a fabrication of the "gubmint" and populated exclusively by government-paid crises actors, all brought to you by Disney™, for the use of the government to do false flag operations for no other reason than they get bored during the weather-control and mind-control ray off-season. Or somesuch. Except, it turns out that the evil Muslim scumbag killer jihadist might have himself been gay. So there goes homophobia. And that thousands of people were affected by this, so there goes the false flag idea. And that the weapons he used were about as average as can be, so there goes the "assault weapons" thing (aka SBWs or Scary Black Weapons). And, so far, there isn't any particular evidence that he was just nuts. So that idea doesn't have much to back it up. But what there is evidence for is that he was a devout, Quran-carrying Muslim, the son of an Afghan pro-Taliban, and pro-Sharia Law presidential candidate, as well as a self-professed follower of ISIS. He also hollered the old "Admiral Ackbar!" or "Allahu Snackbar" or whatever thing that terrorists literally always holler when they are committing murder. And Obama is mad as an old hornet about people (Trump especially) pointing out how he, once again, refused to mention the words "Islamic Terror" in his pointless speech about this obvious Islamic Terror Attack in Orlando. Wouldn't it be nice if he showed as much anger and emotion about, oh I don't know, the actual attack maybe? Ah but who are we kidding? Obama doesn't care about some peasants citizens being murdered in a night club. The important thing to him is not offending Muslims by calling an Islamic spade an Islamic spade. And the media and the majority of the political class are doing the same thing. Why is this so hard for them to accept? 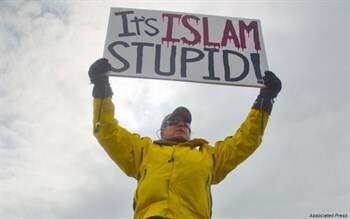 Seriously, there is nothing more or less to this: It's Islam Stupid! Fort Hood was Islam Stupid! San Bernardino was Islam Stupid! DC Snipers were Islam Stupid! London 7/7 was Islam Stupid! And the total of 48 post-9/11 attacks within the US and the many many more outside of the US, the vast majority of the Iraq "insurgency", the emergence of ISIS, the rapes and attacks throughout Europe, etc, etc, etc...ALL ISLAM STUPID! You cannot solve a problem when you aren't willing to identify the cause of the problem.